Subscribe and get the latest hot offers, prices, news and special discount ! I agree to my personal data being stored and used for distribution of the Harmony Suites marketing materials. I agree with my personal data to be stored and used. The data from this form will only be used by Harmony Suites. We will keep your phone and email so our specialists can contact you. Warm, gentle sea. Miles of shimmering beaches. Utter tranquility. The purest air. If that sounds like your dream vacation, you're in the right place. / If that sounds like your dream vacation, then what we have to offer you will relentlessly strike your fancy and live up to even your most audacious desires. Bulgaria's Black Sea coast can easily rival the Greek Mediterranean, Croatia’s Dalmatia, and the French Riviera. 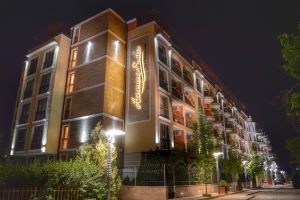 Harmony Suites is proud to offer you affordable luxe in the heart of Bulgaria's best seaside resorts – Sunny Beach and St. Vlas. 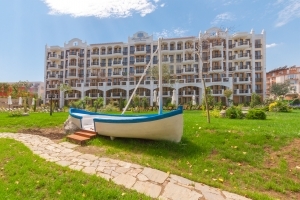 Renting a property in Bulgaria for your summer vacation has never been easier, more luxurious, and yet more affordable. Can you resist the warm embrace of the summer sea, gently caressing your noble skin while your kids are having the time of their life on our artificial river? Don't let the family charm deceive you, though. Our suites benefit from unparalleled tranquility, but at the same time, they are within a short walking distance from the buzzing nightlife of Bulgaria's hottest party destinations. If nightlife doesn't interest you anymore, how about a cozy jacuzzi, a sweat in the sauna, a walk in a verdant park, or probably a gym session? We have it all – to live up to your bravest holiday expectations. 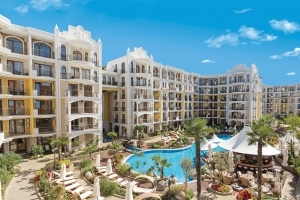 Harmony Suites is the developer of numerous prestigious apartment complexes in Bulgaria’s top-notch seaside resorts. We also handle the management and maintenance of real estate. Since we’re both a developer and an owner, you can rent a property without any intermediaries. This means that the prices don’t include any additional commercial markups, making our offer much more affordable to you than intermediary companies. *When multiple discounts are combined, only one discount applies – the one that is more beneficial to the client. Check-in – standard. During check-in, you will have to pay a security deposit, amounting to EUR 100, and submit your passport to the receptionist. Check-out time is until 12:00. Later check-outs are paid. 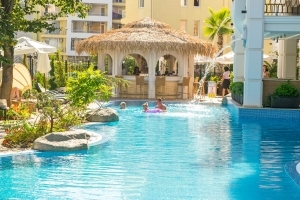 You can easily choose one of the various vacation options we offer to best suit your needs. We’ll ensure you vacation by the sea is an experience you’ll always remember. 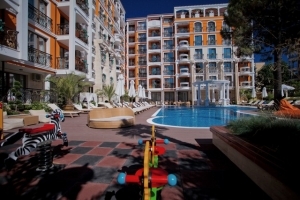 If your dream is to have an unforgettable holiday in comfort and luxury by the Black Sea, you’ll love our apartments. All Harmony Suites complexes are in superb locations, and you can rent them for any period of time. You’ll no longer have to look for good hotel deals on the Bulgarian Black Sea coast in the peak holiday season. Contact us at any point of the year, and we’ll not only offer you different apartment options but also assist you in choosing the one that best matches your individual needs and requirements. We’ll show you that luxury doesn’t need to break the bank. However, in Sveti Vlas, we offer you something more than luxury – fantastic sea air, utter tranquility, and dazzling beach strips with golden sands. Only one word can describe it – priceless. The pure sea air, the warm and generous sun, the mild climate, and the stunning nature in Sunny Beach will provide a striking therapeutic effect for you and your family. and you’ll end up with an unforgettable vacation in Bulgaria. No noisy neighbors, loud companies, or inconsiderate housekeeping staff. Nothing will disturb your peace and quiet. Your only worry will be where to spend your day – by the pool, at the beach, or in the jacuzzi. And the best thing? Your property (or properties if you invest in more than own) could bring you a stable income even during your absence. Click on the green button on the right, and we’ll call you shortly to discuss the details about your stay in Bulgaria. By getting in touch with us for renting property in Bulgaria, you’ll find much more than just attractive prices. You’ll also avoid the hassle of wondering which is the right option for your stay or which hotel to book – even in the height of the summer season. You can arrive at any time of the year – at your own convenience. In Harmony Suites, you’ll live in a ultra-convenient environment and luxury apartments, where your only “job” is to figure out how to dispose of your free time – by relaxing in the green areas, by lying by the pool, or by meeting friends and family.